These days I've been trying hard to work through my fabric stash, mostly to justify buying more fabric! With the end of the school year coming, I decided to figure out a cute teacher gift that would help with my de-stash goal. Here's what I came up with. I'm a big proponent of reusable bags. But, you don't always want to whip out your smelly grocery bag when you're at the mall or library. 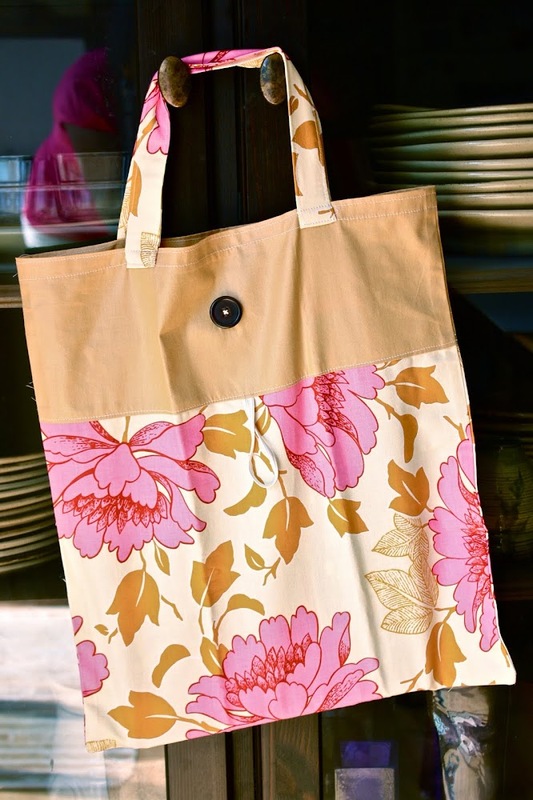 So why not make a cute little tote with some beautiful fabric. Fold your piece of elastic in half and baste at the center of one of the 15 inch sides of the main body fabric. 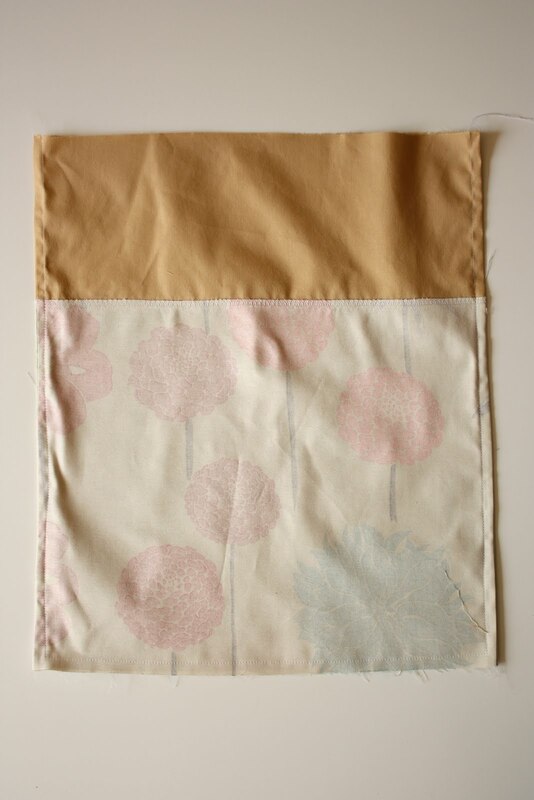 Lay a contrasting panel on top of the main panel, sandwiching the elastic in between, and sew a 1/4 seam. Finish seam with either a zig-zag stitch or serge. Do the same for the other main body and contrasting panels. 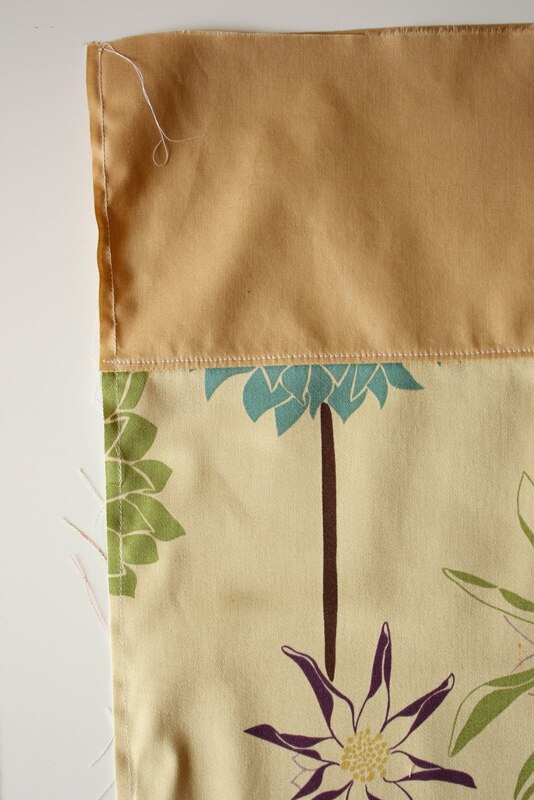 Press seam allowance towards the upper contrasting panel and top-stitch. Since this bag isn't lined, I decided to do french seams on the sides. To do this, lay the front and back panels with WRONG sides together, so right sides facing out, and sew a 1/4 inch seam down each side only. Turn the bag so that RIGHT sides are facing in and WRONG sides are facing out. Press well. Then sew a 1/2 inch seam down one side, across the bottom and up the other side. It's very important that this seam be wider than the previous seams so that the previous seam will be enclosed. Serge or zig-zag to finish the bottom seam and turn bag right side out. Press. Now set the bag aside and let's work on the straps. First, fold strap in half lengthwise, open the fold up and fold edges again towards the center fold. You should end up with a 1 inch x 16 inch strap. Sew along both edges. Now that the straps are ready, take the main body of the bag and serge or zig-zag around the top. Then fold the top towards the wrong side of the bag 1/2 inch to finish off the top. Take each strap and fold the raw edge in about 1/2 inch. Then pin 3 inches in from the edge of the bag. Sew 2 seams across the top to secure the straps in place. Sew your button about 3 inches above the elastic and you're done! Fold your bag up and throw it in your purse. I love this! I will definitely be making one of these. Hello, I'm a new follower! I found you via a tweet from One Pretty Thing a bit ago! I love this tutorial. Looks so great and is practical too. Thanks for sharing! That is so great! I usually need tote for lunch, but afterwards don't need it anymore (yes, I belong to the clean plate club) so this will work perfectly... now, to dust off my sewing machine! Cool! Once our sewing machine is fixed, this is a must make. Thanks for sharing! It's a great idea. I always use a backpack for my groceries (because I bike most of the times) or my bike-bags. In the backpack I carry a fold-up tote, that I can use when I buy more than I expected... Works great. Great idea...love the fabric! New follower, found you on Craft Gossip. This is such a cute tutorial, but I have a question.In the second picture you show the 4 pieces of fabric. They are suppose to be 15x10 and 15x8, but I'm not sure how that can possibly be. The floral pieces look much bigger then the solid ones. I'm new to sewing. Please forgive me if I totally missed something. Aubrey, thanks for the comment! I corrected the dimensions, the contrasting band should be 15X6. Thanks so much for pointing this out! Perfect! Love the bag..love the fabric! if anyone is interest in the fabric, it is from the Amherst Fabric Coop...find us on Facebook! Thanks so much for the totorial, I will be making some for sure! Oh wow, I love this bag! Even a newbie sewer like myself could probably make a few these as gifts. Thanks for the great tutorial! Ruby, I am in the middle of making this bag...actually about to attach the straps, but my top edge is still raw....am I missing something? Do I fold the top of the bag in before I sew on the straps? Super easy to follow! Thank you for sharing:) Love the flowers as well. I made it and blogged about it today. It's a great pattern. Love it. Thanks for posting. I haven't made the tote yet, but plan on making several. I like to make something for my co-workers for Christmas and this is a great idea. I also plan to make some as gifts for my friends too. Thank you so much for sharing. This is perfect. I reaally need one. Thank you so much for such an wonderful pattern and tut. I've just made my first one and it is adorable. Your directions are so easy and the step-by-step photos are fantastic. 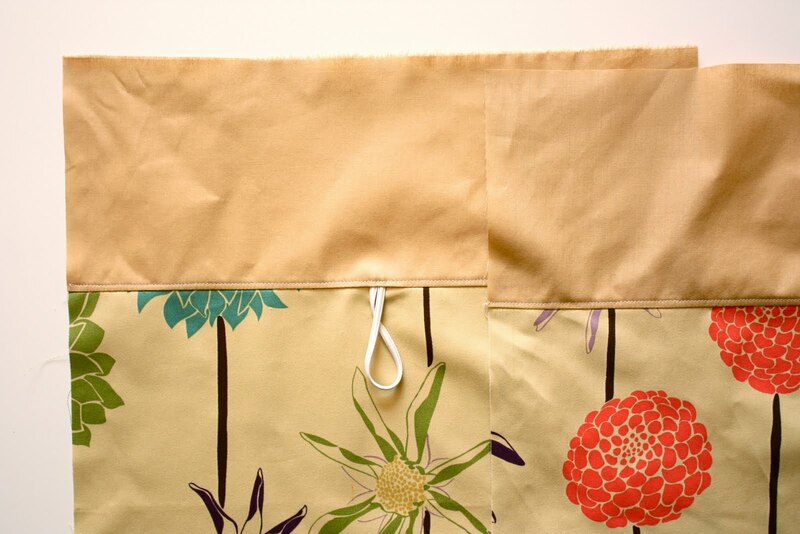 My new fold-up tote will store easily in my glove box, purse or even suitcase when traveling. Love this bag! I am curious, though, do you think that it could be made out of 2 fat quarters? I'm thinking it could be it you made the straps out of the same fabric as the smaller bag pieces. Does anyone know for sure, though? Someone can correct me if I'm wrong, but you can make this from a fat quarter. A fat quarter is 18x22, so you can cut it in half and have two pieces that are 18x11 which is enough for the main body of the bag. But yes, you'd have to make the handles out of another fabric. Thanks, Ruby! I made one of these bags today and it turned out just adorable. I can't wait to make more. U got a new follower! I made this for my co-worker today; it's looks so nice, and I think she'll love it. Thanks very much for the excellent instructions! I too, need to use up fabric from my stash. I've got WAY too much. This is a great idea to use up some of my stash and be eco friendly at the same time. Love your site. I am your newest follower. Your welcome to come check out a few of my sewing projects. Great instruction and step-by-step photos!! I am a beginner and was easily able to follow your tutorial. I made the bag and love it. I'm going to make a larger bag for groceries and the farmer's market. Being a beginner it would be really helpful if you shared the type of fabric you use, or maybe "suggest" fabric types...that is one thing I always wish bloggers would add to their sewing tutorials...I am not super familiar with fabrics and what I can use. Thanks a bunch for sharing! I know what I`m doing tonight when the kids go to bed tonight. Might just replace all my grocery bags with these! Thanks for the great tutorial. Just finished my first tote for end of the year teacher's gifts. Going to attach a tag that says " You're tote-ally awesome!" Thanks for the totorial! I made these last year for teacher gifts, using the cutest apple print fabric! They were super easy, thanks for showing me how! Always need another bag, this is a great pattern, much better than my own, great gifts and travel bags! Made 8 of these this past weekend for gifts- LOVE them!! I love this tutorial! I actually featured it on my blog! Stop on by and grab my "featured button" if you'd like! Thank you for a wonderful tutorial. While I was making this I kept thinking about who I was going to give it to. In the end I liked it so much I decided to keep it for myself! I never do that! Thanks again. 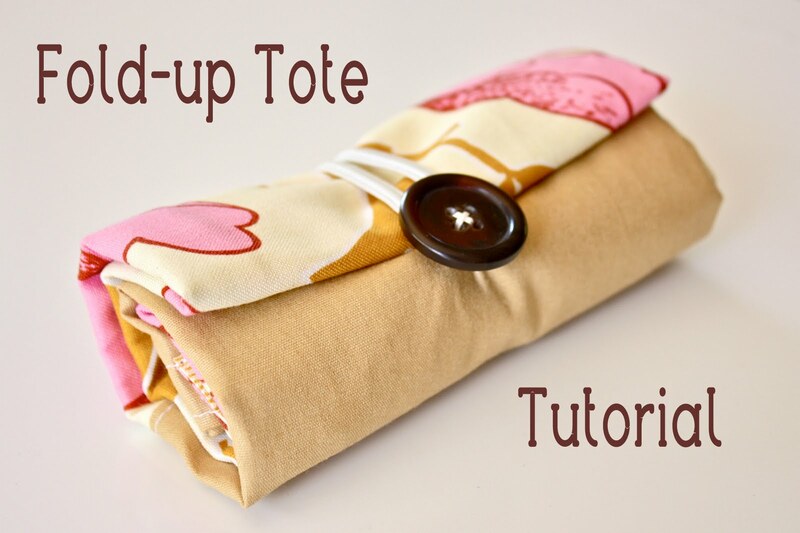 Fantastic tutorial, lovely tote, thank you! Great tutorial. Have made 2 today. Great way to use up your stash. 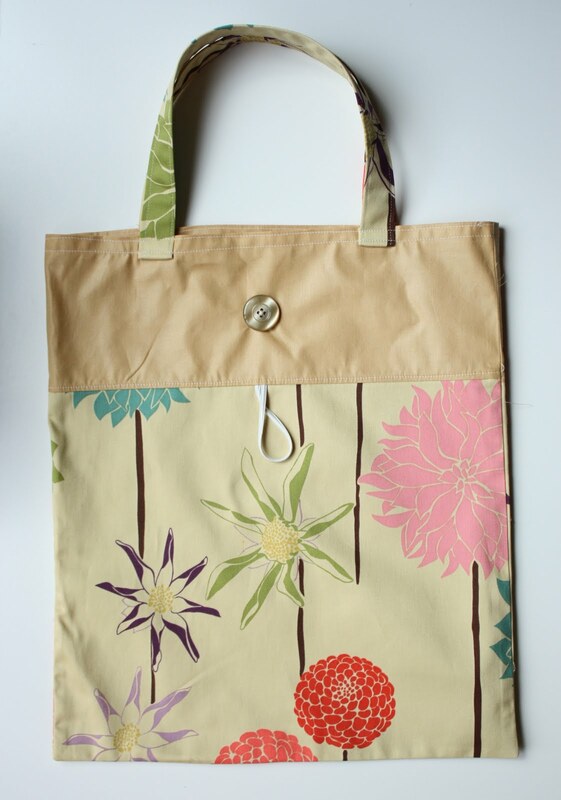 Made your lovely tote for week 3 of my Craft Challenge 2014! Thanks for the tutorial! Not sure if I posted the right link before for my Craft Challenge 2014...in case it was the wrong one. Here it is with the bag I made with the help of your great tutorial! Thanks again! Such a lovely tote bag you had made. Thank you for sharing a very valuable information to us. I am damm sure people will love your creativity. I'll make sure to calculate this kind of stuff in my collection soon so you can even earn money for your creativity. Hi! I wanted to let you know that I made this bag and I have it featured on my blog at dianarambles dot com today. It's a well written tutorial and I'm excited to take this to a sewing swap tonight. Could you add a few extra inches to the bottom and square up (box) the bottom? what a lovely idea! 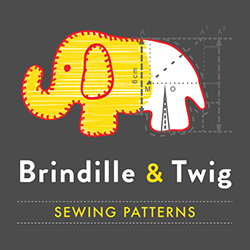 :) Looks great, will have a go as just got a new machine and want to test it out!